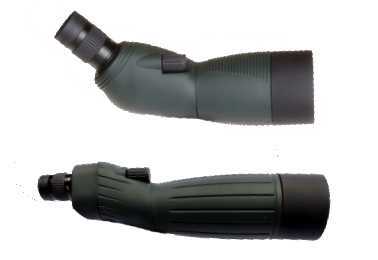 If you’re about to choose a spotting scope, you’ll know that you can get 2 types. Straight scopes where the eyepiece is in-line with the objective lens and angled scopes where the eyepiece is set at a 45 to 90 degree angle from the objective lens. Whilst most angled scopes don’t allow you to adjust that eyepiece angle, they do allow you to rotate the eyepiece around the scope, which offers some versatility in certain positions. Some straight scopes have variants called the porro prism where the eyepiece is mounted in-line with, but slightly above the objective lens. For the purposes of this article we’d still class those as a straight scope because you look in the same direction as the target. 5) More comfortable for prolonged observation. 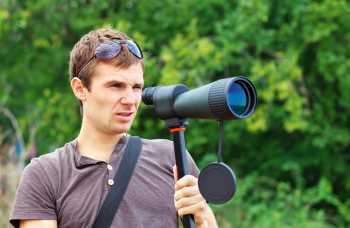 Spotting scopes are a level above binoculars in terms of magnification. They range from 40x-60x magnification. Because it’s difficult to keep anything above 10x magnification steady when held in the hand, you generally use them mounted on a tripod. Both scopes have technically the same resolution, clarity and brightness. There isn’t, or shouldn’t be any optical advantage to one type of scope over the other. If you mount an angled scope on a tripod and align the eyepiece upwards so it’s set like a classic telescope, to look into the scope all you need to do is bend over. The benefits of this are that it’s easier for people of different heights to easily use the same setup without moving the scope. Sit or stand behind a straight scope and people of different heights will find it harder to position themselves correctly without wanting to adjust something. Because you’re normally above the scope looking into the eyepiece, it’s much easier and more comfortable to tilt it upwards and view objects on high terrain or the sky. An angled scope on a tripod can be mounted much lower than a straight scope to give the same view. This means you don’t need such a large tripod. A smaller tripod equals less weight and less room in any pack. For anyone wanting to use the scope outdoors on a windy day an angled scope sits lower on a tripod than the equivalent straight scope. The center of gravity is closer to the ground which makes the tripod more stable in windy conditions. That bent over head forward position is much more comfortable to use for prolonged observation especially because you can be seated or prone. Much more comfortable than the equivalent neck-craning you need to do to properly position yourself for a straight scope. Prone with straight scope, not comfy! Rest your pack on a ridge, set your angled scope on top if it, and you can more easily lie prone and get a good angle on the scope for observation than you would be able to using a straight scope. When they’re used for competitive shooting, in a well setup position, you can switch from the rifle scope to the eyepiece of a rifle scope to a spotting scope with only a slight move of your head. Competitive shooters use the wider fields of view of their spotting scopes to check wind directions and shot results regularly and don’t want to move out of their shooting position to do so. Again, that angled eyepiece and the fact that it makes viewing upwards far more natural, just like a telescope means that an angled scope is great if you want to use it for astronomy. A 60x magnification scope on a clear night will allow you to see the moons of Jupiter. Finding a distant ‘something’ using a straight scope is much more intuitive and most would say easier to do than with an angled scope. You can adjust and become just as good with an angled but most people had an inbuilt sense of direction that just ‘works’ when you pickup a straight scope. Simply because of what I’ve mentioned above about them being more intuitive to use, you’ll find it easier and therefore faster to acquire and track a target using a straight scope. You’re always facing in the same direction so it’s easy to look up from the scope, use your naked eye and then switch back to the scope without having to turn from the target. Seasoned and experienced observers may first want to sweep the landscape using binoculars to acquire a target using their wider field of view and THEN switch to a spotting scope to get a much closer look. Using a straight scope no adjustment of the tripod is needed after the switch, whereas an angled would require you to lower or higher your tripod each time. The eyepiece of an angled scope set pointing upwards naturally provides a small cup shape to collect things. Rain, snow, debris, dust etc. Whilst you could just cover it with a hat or something, depending on where your scope is setup, and for how long you may want to consider the fact that the straight scope eyepiece doesn’t tend to collect the elements quite as easily. Thick brush, high reeds, high walls…. and other types of obstacle that are about the height of a person will make the choice of a straight scope more natural. You can set one up higher than an angled scope with to get the same view without adjusting the eyepiece rotation. Day packs and hunters packs sometimes have scope sleeves. Straight scopes can fit into these more easily. The shape is also just more easily packable and unpackable in any sort of case. Whilst it’s easier to look upwards with an angled scope, the opposite can be said of a straight scope. Angling one downwards if much more comfortable than doing so with an angled scope, especially one with a fixed eyepiece. This really depends on your car and you. If you’ve got a big car and are a small person there’s a lot of room for you to move around in the seat and angle a straight scope exactly how you want it. With an angled scope that has an adjustable eyepiece you can set the scope to see more angles than with a straight scope. You can point it directly in-front of your car and not have to stick your head out of the window to use it. The same goes for behind and up to the sky. The positioning is more comfortable for these angles. Seeing as they can fly… birds tend to spend a lot of the time high up in trees and the sky! The fact that angled scopes make looking UP much easier for prolonged periods makes them a good choice here. As we’ve stated already there’s little or nothing to differentiate the two types of scope on optical quality. An angled scope will put the camera at a downward angle to you and make it easier to share and see what you’re doing from a comfortable position. A straight scope will make it quicker to locate a subject or target (if you have to) and will avoid more sunlight or glare on the screen of the camera. Do you use the type of adapter that easily allows your camera to swing away from the eyepiece when you want to look through it instead? If that’s the case you’ll find that an angled scope which keeps the camera ‘at rest’ in a downward pointing position will help to keep it firmly against the eyepiece and to not ‘swing away’ before you want it to. For competitive rifle shooting in the prone position where you’re spotting for yourself you’re going to find it easier with an angled scope that you can setup in such a way that you can switch from rifle to spotting scope with a slight movement of the head. If you’re looking for a scope that you can setup on target and use for judging or oversight, you’ll again probably be better with an angled. It’s easier to share the scope with others and provides a much more comfortable position in which to observe something for longer periods of time. If you’re out and about with a tripod sweeping with binoculars on there before you switch to a scope for a closer look and see if it’s worth the trek, you’ll find that switch easier with a straight scope. You won’t need to adjust your tripod height. If you’re spotting fast moving targets or you find it easier to keep looking in one direction whilst spotting then switching from spotter to rifle, a straight scope will be more natural for you to use. From a tree-stand you’re going to be looking at a downward angle more often than not. A straight scope will work better for this situation too. You can look through forums, blogs and ask around, but I think if you ask enough people you’ll come to the conclusion that generally people pick a straight scope for hunting. 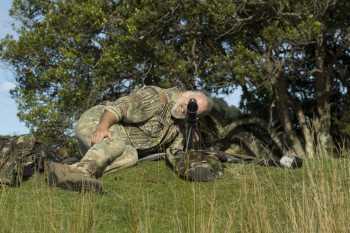 Whilst an angled is more versatile and works better when you’re digiscoping, birding, stargazing or shooting long range competitively from the prone position on your own. Some food for thought in there for everyone. There’s no one size fits all. What do you want your scope for? What will you use it for? That’s the key question. Figure that out, then I’m sure it will become clear from these points which one you should be going for. David, thank you for explaining the advantages of angled and straight scopes so clearly and in so much detail! Your article was very helpful to me. I’ve been interested in photography for some time, but I only recently learned about digiscoping. I’m excited about the prospect of digiscoping with my smartphone camera!